I woke up this morning to find the center cap missing off driver front wheel. After an extensive internet search I have turned up absolutely nothing. Soooo does anyone have any idea where I can find one, or if i can just buy 4 different ones that will work? At this point buying new wheels seems easier than replacing this cap! Post a request under the Wanted section here on the board. Also check eBay; from time to time you can find a single cap there. Club member Harofreak00 dismantles crashed Bonnevilles and sells the parts. He may have one for you. Last edited by Ken_W on Thu Jan 05, 2012 12:57 pm, edited 1 time in total. Ok thanks! Ill just keep looking. GM wanted me to buy the whole wheel. He might have one that he'd be willing to part with. You came out to find only one cap missing?...Lucky you,someone made off with all four of mine and they were the oo carbon fiber style caps....Sorry to hear and hope you find a replacement. GM stuff is so high.I remember when I had my 91 SSE and someone pilfered one of the center caps.I contacted GM and on that car the caps are in two pieces and it came to over one hundred bucks. That they are... I was shocked at the price, but the wheels just arent the same without the caps! Oh I know.The wheel is naked without the cap.I looked on Ebay and out of thirty pages of Pontiac caps there was only ONE listing for the 01 Bonnie. The 00 and 01 swoopie centers are year specific, 2001 being the harder to find for whatever reason. To note: 00 and 01 did have different caps, but they are interchangeable. The base wheel is the same. Yeah,once someone stole all four of my 00 caps I only wanted to replace them with the 01's which I like better.I now have the sawblades but I've wondered which model or year they are specific to? Last edited by keir on Wed Jan 11, 2012 10:19 am, edited 1 time in total. Sawblades, aka bent 5's, are 02+. Thanks...kinda what I thought but it's good to be sure. 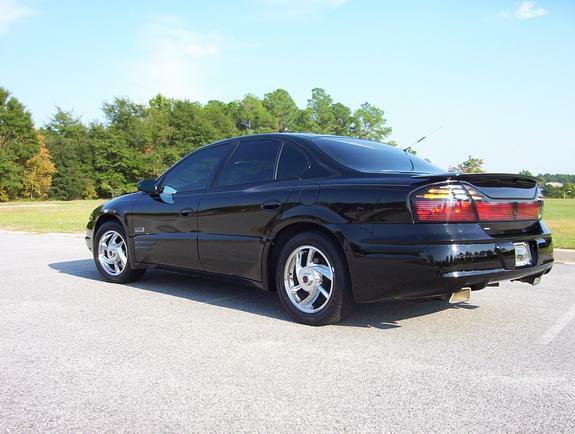 I was wondering if anyone could direct me to finding 2 center caps for my 2001 Pontiac Bonneville SSE (17"/6-Spoke Wheel). 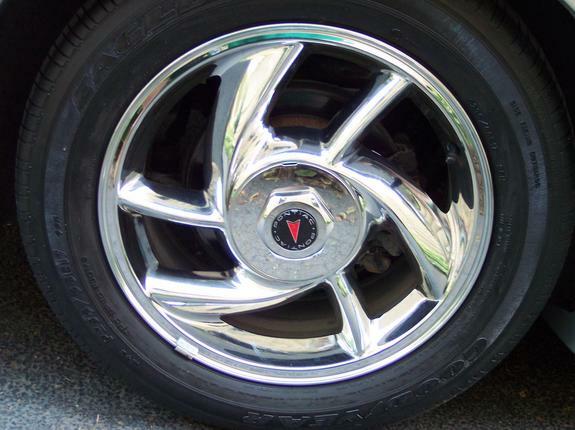 I currently have 2 silver (not chrome-I believe they are painted silver - but design as is pictures below) center caps with the protruding nut in the center that is painted black & has the Pontiac emblem (I've posted a link to a car similar to mine). Or, I'm pretty open to a new full matching set that will fit my current wheels. If anyone knows anyone or has anything please let me know. But I've seen some of the newer Bonnevilles with spoked rims, seen a few pics on here. Which years were those?